I love a pie. 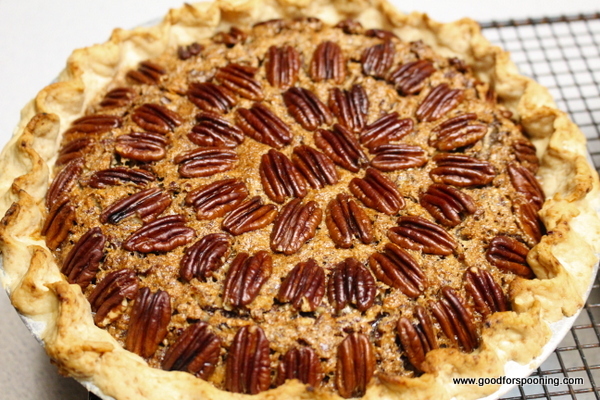 I especially love pecan pie (and for the record I say PEEcan, not puh-khan). Frankly too often pecan pie is really sugary and way too sweet. Soooo, I reworked an old recipe to reduce the sugary-ness and increase the flavor and each time I serve it, it’s a hit. With the baking season upon us and potlucks galore, enjoy this. The end result LOOKS way more complicated than it is. This is a recipe that doubles easily so you can make 2 at the same time. Serve with ice cream, whipped cream or drizzle with cold heavy cream. Each slice (1/8 of a pie can be warmed in a microwave oven in about 15 seconds) prior to serving. 3 Tbsp unsalted butter – DO NOT substitute margarine. Preheat oven to 450. Roll out pie crust and have it ready to go. Using an electric mixer on medium-high, beat first 3 ingredients until light and fluffy. It will not look like the beginning of cookie dough; it will be more granular. Reduce speed and add eggs one at a time until well incorporated, scraping bowl as necessary. Reduce speed again and gradually add first the corn syrup and then the molasses, scraping bowl as necessary. Fold in chopped pecans. Pour into pie crust and bake for 10 minutes at 450. A crisp shell will develop on top while the middle stays syrupy. CAREFULLY remove from oven and reduce temp to 350. 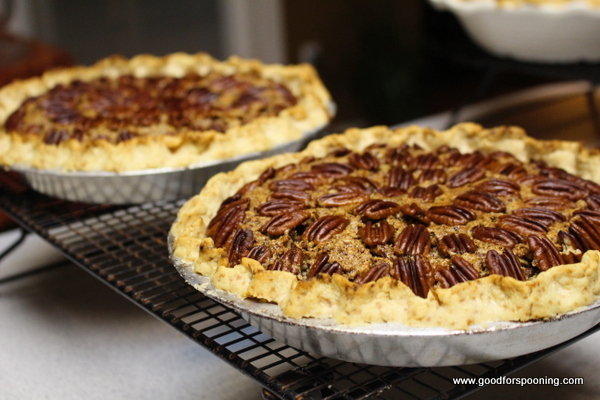 Decorate the top of your pie with the pecan halves. They will sink into the filling a bit as it continues to cook. Return to oven and bake at 350 for 30-35 minutes or until set. Cool completely on wire rack before cutting. If you cut it while hot it will ooze all over the place. It needs to cool completely to allow the sugars to set up. See how the top is puffed up? It will sink down and flatten out as it cools.